I know I have been a bad blogger. I haven't posted in a while. I have been relatively busy, but the real reason is that I just didn't feel like Blogging. I have been trying to deal with some personal issues and I would dearly love to blog some of them just to get it out, but discretion dictates that I don't. Sometimes the things that are internal issues don't really need to be public. I know that this leaves everyone in the dark, but that's the way it must be. 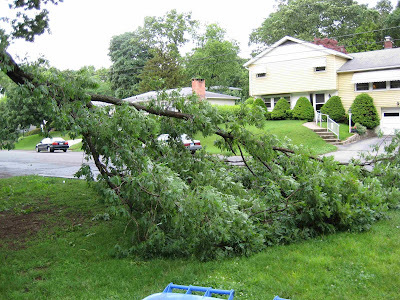 We had a severe thunder storm this afternoon and a huge limb broke of the tree in the front. It covers most of the front yard and half of the street. 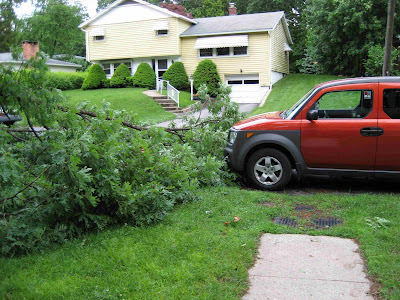 We were very lucky that no cars were damaged. It came close to one of them. I hope to be more regular in blogging, but I can't promise. By the way, I am still loosing weight. I have a long way still to go, but I am feeling better. Wish me well in working through my personal crap.